1. The heat in your shower can vaporize the chlorine that's in it, and when you inhale it, it can go into your bloodstream. As a matter of fact, more chlorine may be absorbed during a shower than by the average amount of unfiltered water you drink during a day. This may cause breathing problems, specially in people with asthma, and other respiratory disorders. 2. The heat in your shower also dilates the pores all over your body which allows your skin to absorb more easily the chlorine in the water. This may cause various skin problems (such as dry skin, itchy skin, etc.). Chlorine may also be absorbed by your hair and may strip it of its natural oils causing dry and lifeless hair, and even dandruff. After installation of a proper shower filter and regular use, you should normally notice not just smoother skin and softer hair, but also more energy and improved breathing. Here is the problem: Not all shower filters will work effectively to remove all the chlorine and chloramine from your shower water! Using KDF (Kinetic Degradation Fluxion) filters which use copper and zinc to electrochemically change the structure of chlorine so that it becomes harmless. Using Activated Carbon filters which are the type of filters you find in water filter pitchers like Brita or PUR. Using Vitamin-C filters which come in the form of ascorbic acid which is a compound that neutralizes chlorine. It is mostly effective at removing free chlorine and may have no appreciable effect on chloramine which is a more stable form of chlorine. The efficacy of the KDF filtration may depend on the contact time of the water with the filter media, and therefore in order to be effective KDF filters may have to restrict the water flow. KDF filtration media may contain certain elements called "free radicals" that can be damaging to human cells due to their interaction at the molecular level with nucleic acids, lipids and proteins. KDF filtration may be subject to degradation by the sedimentary quality of the water supply, and the filter may clog and become ineffective after some use. KDF uses copper and zinc, both of which may affect negatively the color of hair that has been treated with hair coloring. First, note that Active Carbon filtration loses its effectiveness at water temperatures above 80 degrees F, and that the average shower water temperature is around 107 degrees F.
Like KDF filtration, the efficacy of Active Carbon filtration process depends on the contact time with the filter media, and like KDF filters, Active Carbon filters must restrict the water flow to be really effective. Like KDF filtration, active carbon filtration is only effective in removing free chlorine and may have no appreciable effect on chloramine which is becoming increasingly popular as an alternative to chlorine for municipal water purification. Like KDF filtration, Active Carbon filtration may be subject to degradation by the sedimentary quality of the water supply and the filter may clog and become ineffective after some use. Vitamin-C utilizes a rapid chemical reaction in neutralizing chlorine and chloramine, and therefore it is very effective and works at any water temperature and water pressure. Furthermore, Vitamin-C filters do not need to reduce the flow rate of your shower water, and it is not effected by the quality of the water entering the filter. In addition to getting rid of the chlorine and chloramine in your shower water, with Vitamin-C you may also receive its many benefits. In summary, Vitamin-C appears to be a safe way to neutralize the chlorine and chloramine found in your shower water, and provides additional nutrients for your skin and hair. It works well in hot water whereas the other chlorine filtering methods do not. Unfortunately, many shower filters that you can find today are KDF and Active Carbon based and do not use Vitamin-C. The most popular Vitamin-C shower filter brands today are Vitashower SF-2000, UBS Vita-Fresh and Sonaki VitaPure. Note that the UBS and Sonaki Vitamine-C products use practically an identical Vitamine-C filter. We will describe and compare below the Vitashower SF-2000 and UBS Vita-Fresh Vitamin-C shower filters. Since Sonaki VitaPure uses practically the same filter as UBS Vita-Fresh, it will not be compared in this article. But, you will be able to purchase Sonaki VitaFresh Vitamine-C products in the Amazon section below. For those looking for a showerhead with integrated Vitamin-C filter, we will also provide some Vitamin-C showerhead recommendations in the Amazon section below. The Vitashower SF-2000 Shower Filter is made of plastic and attaches easily to existing shower arms and shower fixtures as shown in the picture (both handheld or fixed shower heads will work) and uses 100% pharmaceutical grade Vitamin-C. When the water flows, the filter releases the required amount of Vitamin-C to neutralize chlorine or chloramine, and when the water is shut off, the filter stops releasing the vitamin. This economy of vitamin release, increases considerably the useful life of the filter. Vitashower SF-2000 shower filter is supposed to be capable of neutralizing 99.9% of the chlorine and most chloramine found in your shower water. This is true regardless of the water pressure, water temperature or the quality of your water. As explained above, traditional shower filter technologies available today, such as KDF or Activated Carbon do not work well at higher water temperatures and with low-flow showerheads. The life time of the filter doesn't depend either on the temperature or the pressure of the water and lasts longer than KDF/Active Carbon filters. Note that the flow rate of the shower head is roughly the same before and after Vitashower SF-2000 is installed. The Vitashower SF-2000 Shower Filter promotes all natural skin and hair care, and normally with continued use, improvements in both skin and hair condition should be observed. Like the Vitashower SF-2000, the UBS Vita Fresh Vitamin-C Shower Filter attaches easily to existing shower arms and shower fixtures as shown in the picture (works with both mounted and hand-held shower head designs) and uses 100% organic food grade Vitamin-C. It has a transparent housing which allows you to see the filter cartridge inside and makes it very easy to know when the filter needs to be replaced. Basically, you replace the cartridge when it is all used up which you can actually see through the transparent housing. Like the Vitashower SF-2000, it releases the exact amount of Vitamin-C to neutralize chlorine or chloramine as the water flows, and when the water is shut off, the filter stops releasing the vitamin. Once again, this economy of vitamin release, increases considerably the useful life of the filter. The filter is capable of neutralizing 99.9% of the chlorine and chloramine found in your shower water. This is true regardless of the water pressure, water temperature or the quality of your water. Here again, the life time of the filter doesn't depend either on the temperature or the pressure of the water and lasts longer than KDF/Active Carbon filters, and the flow rate of the shower head is almost unaffected by the shower filter. These shower filters have a life-time of anywhere between 1 to 3 months, depending on the amount frequency of usage. Each filter can effectively neutralize chlorine and chloramine in up to 3,000 gallons of water. 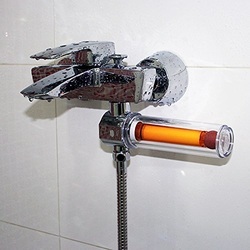 This represents about 2 months of showering in a typical household (2 showers per day, about 7 minutes each). As mentioned, because the filter casing is transparent, you can tell easily when you need to replace it. Note that the filter cartridge is very easy to replace, and that your purchase of this product will already include an extra cartridge. Finally, note also that this filter comes with the special Dolki natural ceramic ball which makes water molecules smaller and energizes the water to improve the hydration. The ball is simply placed at bottom of the filter housing below the filter cartridge. The picture here shows the transparent filter housing, the filter cartridge and the Dolki ball. So which Vitamin-C shower filter to buy? The filter casing of UBS Vita-Fresh is transparent. Therefore, you replace the cartridge when you actually see that it is all used. This is not the case with Vitashower SF-2000 which has an opaque filter casing, and you can not see through. You therefore have to schedule a filter change every so many months of usage based on your showering frequency, the quality of your water, and how you feel after taking a shower. UBS Vita-Fresh is more expensive than Vitashower SF-2000, but the price of the UBS Vita-Fresh includes an extra filter cartridge. 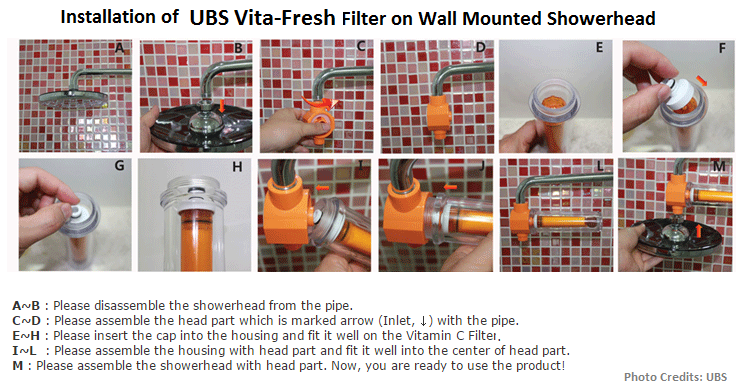 Furthermore, the UBS Vita-Fresh filter replacement cartridges are much cheaper than Vitashower replacement cartridges. As a matter of fact, the price for the entire Vitashower unit is about the same as its filter replacement cartridge price and therefore, instead of getting a replacement cartridge, it makes sense to get a brand new Vitashower SF-2000 filtering unit. In addition, the ease with which you are able to know when to change the filter cartridge makes the UBS Vita-Fresh a better choice in spite of the higher initial price. When you consider all the above points, we prefer UBS Vita-Fresh over Vitashower SF-2000. Note that, if at the time you place the order the UBS Vita-Fresh is not in stock in the US, you may have to wait for a couple of weeks, as it will be shipped from Korea. You will find below on Amazon a choice of Vitashower SF-2000, UBS Vita-Fresh and Sonaki VitaPure shower filters. When you click the Amazon product links below, you will be transferred to the Amazon.com site where you can get exact price information or shop safely for the product or products you need. Sonaki also makes Vitamine-C filters and showerheads. Note that the Sonaki Vitamine-C products use practically the same Vitamine-C filter as UBS Vita-Fresh described above. However, the Sonaki shower connection assemblies are slightly different than UBS Vits-Fresh and are made of brass. They also do not contain the ceramic ball found on the UBS Vita-Fresh. Two of the most popular Sonaki shower filter assemblies are shown below. The first one is used with a Vitamine-C filter. It comes with 3 Vitamine-C filter cartridges included. The second one uses both a Vitamine-C filter and a PureMax filter. The PureMax filter with Activated Carbon Fiber and bio ceramics also removes chlorine, heavy metals, sediment, Phenol and other disinfection by-products.​ The assembly comes with 4 Vitamine-C filter cartridges and 1 PureMax filter cartridge included. Important Note: For those who don't already have a showerhead or who are looking to replace their existing showerhead, you can buy nowadays Vitamin-C showerheads with built-in filtering (you just need to replace the filtering cartridge when required). Have you not found yet the what you were looking for?